Recent thymic emigrants (RTEs) are the youngest T cells in the lymphoid periphery and exhibit phenotypic and functional characteristics distinct from those of their more mature counterparts in the naive peripheral T cell pool. We show in this study that the Il2 and Il4 promoter regions of naive CD4+ RTEs are characterized by site-specific hypermethylation compared with those of both mature naive (MN) T cells and the thymocyte precursors of RTEs. Thus, RTEs do not merely occupy a midpoint between the thymus and the mature T cell pool, but represent a distinct transitional T cell population. Furthermore, RTEs and MN T cells exhibit distinct CpG DNA methylation patterns both before and after activation. Compared with MN T cells, RTEs express higher levels of several enzymes that modify DNA methylation, and inhibiting methylation during culture allows RTEs to reach MN T cell levels of cytokine production. Collectively, these data suggest that the functional differences that distinguish RTEs from MN T cells are influenced by epigenetic mechanisms and provide clues to a mechanistic basis for postthymic maturation. Recent thymic emigrants (RTEs) comprise a peripheral T cell subset of key importance in neonates and individuals recovering from lymphoablation (1, 2). These newly generated T cells enter a ∼3-wk period of postthymic maturation and display distinct phenotypic and functional characteristics compared with their more mature, yet still naive (MN), T cell counterparts. Chief among these differences is altered activation-induced IL-2 and IL-4 production. Neither human nor murine CD4+ RTEs reach MN T cell levels of IL-2 production after activation (3–5). Murine CD8+ RTEs responding to bacterial infection are defective in IL-2 production and remain so even 60 d postinfection (6), well after they have graduated from the RTE compartment. Although production of IL-4 by adult RTEs is dampened under non-polarizing activation conditions, it is significantly higher than that by MN T cells in response to a Th2-polarizing environment (5). Thus, activated RTEs are not universally defective but subject to differential interpretation of the environmental cues that mold the T cell response along the appropriate Th lineage. Regulation of cytokine gene expression in T cells is mediated by a combination of cis-regulatory DNA elements and trans-acting transcription factors. These transcriptional regulatory networks have been studied extensively during Th lineage commitment and differentiation (7–9). Differential cytokine receptor (3, 5) and transcription factor (5) expression likely contribute to the functional differences between RTEs and MN T cells. Epigenetic modification and chromatin accessibility at key cytokine loci also contribute to Th lineage commitment and stability (10), but given prior technical challenges in separating RTEs and MN T cells, their influence on the distinct functional repertoire of adult RTEs remains unexplored. One such epigenetic mechanism involves the addition of a methyl group to cytosine nucleotides followed by guanine nucleotides (CpGs). DNA methylation at CpG sites, especially in the regulatory regions of a gene, is usually associated with gene silencing, and demethylation often correlates with increased gene expression in most mammalian species (11). Activation of naive CD4+ T cells leads to demethylation of the Il2 promoter, and this correlates with IL-2 production, although the precise sites that undergo demethylation differ between mice (12, 13) and humans (14). Demethylation at several CpG sites in the Th2 cytokine locus is required for Th2 differentiation (8, 15). We now show that cytokine production by adult naive and activated CD4+ RTEs and MN T cells is under divergent epigenetic regulation, characterized by distinct DNA methylation patterns at the Il2 and Il4 promoter regions. 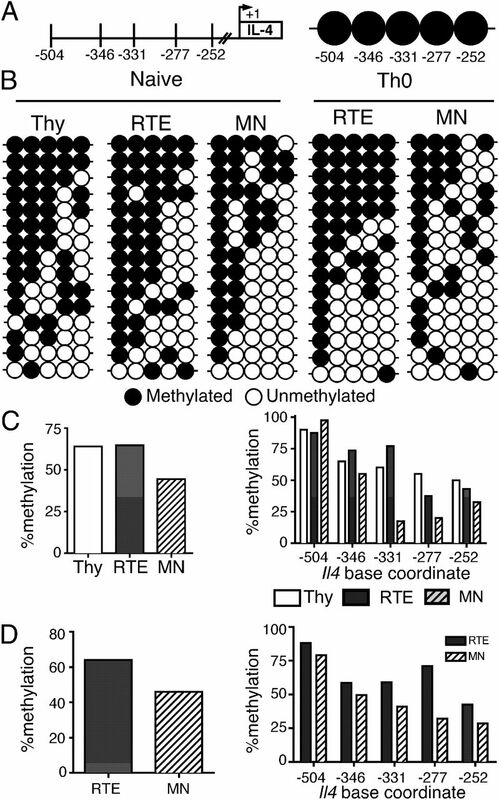 Chemical inhibition of DNA methylation during nonpolarized T cell activation drives cytokine production in RTEs to MN T cell levels, and naive RTEs express higher levels of some key DNA methylation modifying enzymes than their mature counterparts. Furthermore, divergent methylation patterns distinguish the cytokine loci in RTEs from those in their immediate thymocyte precursors. These data reveal for the first time, to our knowledge, that RTEs do not merely occupy a midpoint between mature thymocytes and peripheral T cells but instead represent a true transitional compartment, one whose cytokine responses are subject to careful and tailored regulation. C57BL/6 and RAG2p-GFP transgenic C57BL/6 mice (16) were bred and housed under specific pathogen-free conditions and were used between 6 and 12 wk of age. All experiments were performed in compliance with the guidelines of the University of Washington’s Institutional Animal Care and Use Committee. Single-cell suspensions of lymph nodes and splenocytes were prepared and sorted to obtain CD62L+CD44loCD4+GFP+ RTEs or GFP− MN T cells, using a combination of positive and negative enrichment, as described previously (17). Thymocytes were sorted as CD4+CD8−GFP+TCRβ+CD69lo or CD4+CD8−GFP+TCRβ+CD62Lhi cells to obtain the most mature CD4 SP cells and to rigorously eliminate any GFP− T cells that have re-entered the thymus. Cells were kept on ice during the sort to prevent activation-induced demethylation. Cells were sorted on a FACSAria (BD Biosciences), and post-sort analysis confirmed that cells were >99% CD4+. Sort-purified CD4+GFP+ RTEs and GFP− MN T cells (labeled where noted with 4 μM CFSE) were cultured for 3–5 d with APCs under Th0 and Th2 conditions, using 60 ng/ml anti-CD3 (145-2C11) and 1 μg/ml anti-CD28 (37.15), both from BD Biosciences, as described previously (5). Cells used for methylation analysis were resorted to eliminate contaminating APCs. Where noted, 2.5 μM 5-azacytidine (Sigma-Aldrich) was added to cultures on day 0, a concentration that demethylates DNA in cells undergoing division (18). After 3 d, CFSE dilution was analyzed as a measure of proliferation. Remaining cells were washed, and 50,000 were seeded into 96-well plates coated with 0.72 μg/ml anti-CD3 and 5 μg/ml anti CD28. Cell-free supernatants were harvested on day 3, and IL-2 and IL-4 were measured by ELISA (R&D Systems). Sorted cells (RTEs, MN T cells, and mature CD4+ SP thymocytes, generated as described above) were fixed with the Foxp3 Staining Buffer Set (eBioscience), according to the manufacturer’s protocol, and stained with Abs specific for CD4 (eBioscience) and DNA methyltransferase (DNMT)1 (H-300) or DNMT3a (H-295), both followed by goat anti-rabbit IgG PE (Jackson ImmunoResearch Laboratories), or DNMT3b (2280C3a), followed by biotinylated rat anti-mouse IgG2b (BD Biosciences) and streptavidin–PE (eBioscience). All DNMT-specific Abs were from Santa Cruz Biotechnology. DNMT3a (19) and DNMT3b (Santa Cruz Biotechnology) Abs have been reported for use in flow cytometry. Primary Abs were incubated for 20 min, secondary Abs for 15 min, and streptavidin–PE for 10 min, all at 4°C. Data were acquired using an LSRII flow cytometer (BD Biosciences) and analyzed using FlowJo software (Tree Star). Cytokine production by cells used for methylation analysis was assayed by intracellular staining and ELISA. DNA was extracted, using the QiaAmp DNA Mini Kit (Qiagen), and subjected to bisulfite modification, using a modified protocol (20). Briefly, DNA was denatured with NaOH and incubated 16 h with hydroquinone and sodium metabisulfite (MP Biomedicals). DNA was then desalted, desulfonated with NaOH, neutralized with ammonium acetate, precipitated with ethanol, and resuspended in dH2O. Bisulfite-treated DNA was PCR amplified using nested primers for four sites in the Il2 promoter (12, 13) and for five sites in the Il4 promoter (21). Eighteen cycles of a touchdown PCR protocol were used to reduce nonspecific amplification. A second 40-cycle round of amplification was performed using 1 μl of the first-round PCR product. PCR products were gel purified using the QiaQuick gel extraction kit (Qiagen) and cloned using the TOPO TA cloning kit (Invitrogen). Plasmid DNA was isolated from 2 ml overnight cultures using the FastPlasmid Mini Kit (5 Prime), and individual clones were sequenced using M13 reverse primers. Only sense strands and sequences of fully converted alleles were used for analysis. The generation of oligo(dT)-primed cDNA and quantitative RT-PCR were performed as previously described (5), using the following primer sequences: Dnmt1 (forward, 5′-GAGCCAGCCCAGAGATCC-3′; reverse, 5′-TCGTCTCTGTCCTCGGGAGTC-3′), Dnmt3a (forward, 5′-CGCAGCGTCACACAGAAG-3′; reverse, 5′-GGGTTGACAATGGAGAGGTC-3′), Dnmt3b (forward, 5′-CCAGTCTTGGAGGCAATCTG-3′; reverse, 5′-GGCTGGAGACCTCCCCTCTTA-3′), Tet1 (forward, 5′-GAGCCTGTTCCTCGATGTGG-3′; reverse, 5′-CAAACCCACCTGAGGCTGTT-3′), and hypoxanthine guanine phosphoribosyltransferase (HPRT, forward, 5′-GTTGTTGGATATGCCCTTGAC-3′; reverse, 5′-CAACTTGCGCTCATCTTAGGC-3′). Reactions were run in triplicate, and samples were normalized to the internal HPRT control, whose expression levels were validated in all cell populations. We set about to test whether naive CD4+ RTEs exhibit differential methylation at the Il2 promoter compared with mature CD4+CD8− single-positive (SP) thymocytes and peripheral MN T cells. We performed bisulfite genomic sequencing on DNA from CD4 SP thymocytes and naive (CD62LhiCD44lo) RTEs and MN T cells, focusing on the four CpG sites (Fig. 1A) most proximal to the Il2 transcription start site. These sites were chosen for analysis because their demethylation correlates with IL-2 production (12, 13). We now show that naive CD4+ RTEs are hypermethylated in this region, with ∼45% of all CpG sites methylated, compared with ∼38% in SP thymocytes and ∼31% in MN T cells (Fig. 1B, 1C). In particular, sites −261 and −216 exhibit greater methylation in naive adult RTEs than in either thymocytes or MN T cells. Distinct methylation patterns at the Il2 promoter in adult CD4+ RTEs. DNA methylation analysis for four sites in the Il2 promoter with sodium bisulfite–treated genomic DNA from mature (GFP+TCRβ+CD69lo) CD4+ SP thymocytes (Thy) and naive and 3-d Th0-activated CD4+ RTEs and MN T cells. (A) The four CpG sites analyzed upstream of the transcription start site, represented as circles and shown in order from promoter distal to proximal. (B) Each row represents a cloned and sequenced allele. At least 30 clones from each population were sequenced per round, of which 15 are shown. For naive (C) and Th0-activated samples (D), graphs show the percent methylation for all CpG sites (left panel) or at each individual site (right panel) in mature Thy, RTEs, and MN T cells. Data are compiled from at least three experiments per group and include biological replicates. To determine the methylation status of the Il2 promoter during activation, we stimulated purified CD4+ RTEs and MN T cells under Th0 conditions for 3 d, by which time, most cells have divided at least once. As expected, activated MN T cells proliferate more robustly and produce more IL-2 than do RTEs (Fig. 2A, 2B) (5). RTEs have undergone substantial demethylation of the Il2 promoter, leaving only ∼31% of all CpG sites methylated (Fig. 1B, 1D), whereas methylation in MN T cells remains relatively unchanged. Activation-induced demethylation of the Il2 promoter in RTEs occurs mainly at sites −261 and −216, leaving site −68 heavily methylated. CD4 RTEs and MN T cells subjected to bisulfite genomic sequencing are functionally distinct. CFSE-labeled CD4+ RTEs and MN T cells were activated under Th0 conditions for 3 d or Th2 conditions for 3 or 5 d, and cytokine production was measured by intracellular staining or ELISA. (A) Histograms show CFSE dilution by nonactivated (dotted line) and 3-d Th0-activated RTEs (shaded) and MN T cells (solid line). IL-2 (B) and IL-4 (C) production by Th0-activated RTEs and MN T cells. IL-4 production by Th2-activated RTEs and MN T cells at 3 d (D) and 5 d (E). Similar analyses were performed on each of the samples subjected to bisulfite genomic sequencing. An unpaired Student t test was used to calculate p values. For differences between RTEs and MN T cells in proliferation and IL-2 and IL-4 secretion, p < 0.01 under Th0 conditions and p < 0.001 under Th2 conditions in data compiled from four independent experiments. Similar analyses of five CpG sites in the Il4 promoter region (Fig. 3A), whose demethylation is associated with high level IL-4 production (22), show that naive RTEs are hypermethylated in this region, with ∼65% of all CpG sites methylated compared with ∼45% in MN T cells (Fig. 3B, 3C). The site most distal to the transcription start site (−504) is almost completely methylated in all three populations, whereas naive RTEs are more highly methylated than either SP thymocytes or MN T cells at sites −346 and −331 and than MN T cells at site −277. The most dramatic difference in methylation is at site −331, with ∼77% of RTE alleles methylated compared with ∼18% of alleles in MN T cells. Distinct methylation patterns at the Il4 promoter in adult RTEs directly ex vivo. DNA methylation analysis for five sites in the Il4 promoter with sodium bisulfite–treated genomic DNA from mature (GFP+TCRβ+CD69lo) CD4+ SP thymocytes (Thy) and naive and 3-d Th0-activated CD4+ RTEs and MN T cells. (A) The five CpG sites analyzed upstream of the transcription start site. (B) At least 26 clones from each population were sequenced per round, of which 15 are shown. For naive (C) and Th0-activated samples (D), graphs show the percent methylation for all CpG sites (left panel) or at each individual site (right panel). Data are compiled from at least three experiments per group and include biological replicates. To determine the methylation status of the Il4 promoter during nonpolarized activation, we stimulated purified CD4+ RTEs and MN T cells for 3 d under Th0 conditions. 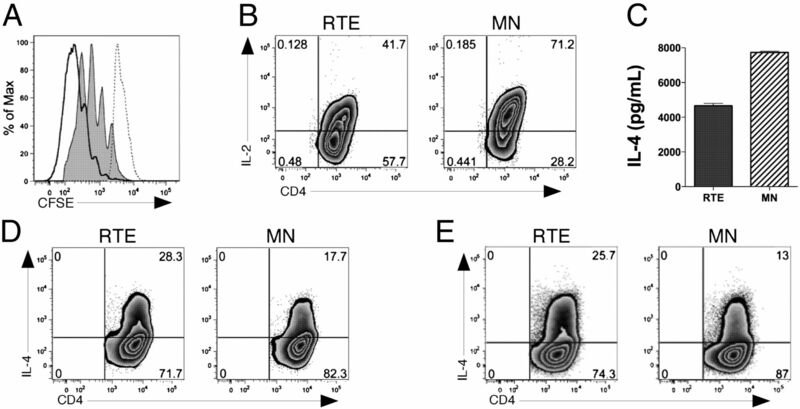 At this point, MN T cells produce more IL-4 than RTEs, as measured by ELISA (Fig. 2C) (5). Despite these functional changes, ∼63% of all sites within the Il4 promoter are methylated in RTEs, compared with ∼45% in activated MN T cells (Fig. 3B, 3D). After 3 d of polarized Th2 differentiation, the majority of RTEs and MN T cells have divided, and >25% of RTEs produce IL-4 (Fig. 2D) (5). At this point, both RTE- and MN-derived T cells exhibit similar levels of methylation at the Il4 promoter (∼42 versus ∼36%) (Fig. 4A). Demethylation in this region is progressive (Fig. 4), and by day 5, RTE- and MN-derived cells are ∼35 and ∼27% methylated in this region, respectively (Fig. 4A). Dramatic demethylation of the Il4 promoter accompanies Th2 differentiation of RTEs (Fig. 2D, 2E), whose alleles progress from 65 to 35% methylation at all CpG sites analyzed, with the most striking demethylation (75–13%) occurring at CpG site −331 (Fig. 4B). Th2 differentiation of adult RTEs drives progressive Il4 promoter demethylation. DNA methylation analysis for five sites with sodium bisulfite–treated genomic DNA from CD4+ RTEs and MN T cells stimulated under Th2 conditions. (A) Graphs show the percent methylation for all CpG sites in RTEs and MN T cells at days 3 and 5. At least 26 clones from each population were sequenced per round. (B) Data from naive (Fig. 3) and Th2 clones were graphed to show the percent methylation at each CpG site in the Il4 promoter in RTEs and MN T cells during Th2 differentiation. Data are compiled from at least three experiments per group and include biological replicates. To test whether hypermethylation at the Il4 and Il2 promoters might drive reduced cytokine production by Th0-activated RTEs, cells were activated in the presence of 5-azacytidine, a potent DNA methylation inhibitor in dividing cells. As expected, Th0-activated MN T cells secrete more IL-2 (Fig. 5A) and IL-4 (Fig. 5B) than do RTEs. After pharmacologic inhibition of methylation, RTEs and MN T cells produce similar levels of IL-2 and IL-4, despite more robust proliferation by (and consequently more complete demethylation in) treated MN T cells (Fig. 5C). The enhancement of IL-2 secretion by RTEs relative to mature T cells in the presence of 5-azacytidine is less dramatic than for IL-4, perhaps because undivided T cells are able to produce IL-2, in contrast to the requirement for cell division of IL-4 production (23). These results suggest that the distinct cytokine production pattern of RTEs is in part controlled by DNA methylation. However, these data do not reveal the identity or location of the key CpG sites, given that 5-azacytidine demethylates DNA without site specificity. Similar cytokine production by Th0-activated RTEs and MN T cells after inhibition of methylation. CD4+ RTEs and MN T cells were CFSE-labeled and activated under Th0 conditions for 3 d in the presence or absence of 5-azacytidine (5-aza). (A) IL-2 production as measured by ELISA. (B) IL-4 production as measured by ELISA. (C) Percentage of cells that have divided one or more times by day 3 of activation, as measured by CFSE dilution. Data are mean ± SEM and are compiled from at least three independent experiments. *p < 0.05, **p < 0.005 (unpaired Student t test). DNA methylation is driven by three DNA methyltransferases, DNMT1, DNMT3a, and DNMT3b. DNMT1 is a maintenance methyltransferase, copying the methylation patterns from the parental strand to progeny during division, whereas DNMT3a and 3b are able to methylate both hemi- and unmethylated DNA (10, 24, 25). Although the details of the individual roles played by each DNMT in lymphocyte cytokine gene regulation remain to be illuminated, DNMT3a is of prime interest because its expression is regulated by TCR stimulation, and loss of DNMT3a in CD4+ T cells leads to dysregulated cytokine production (26). Demethylating DNA is of equal importance in regulating gene activity, and while the mechanisms for removal of DNA methylation are unclear, the ten-eleven translocation (TET) proteins have recently become prime candidates for this function because they have hydroxylase activity and are able to oxidize 5-methylcytosine (27). With these mechanisms for gene regulation in mind, and given the distinct methylation patterns in the sense strands of the cytokine loci in mature SP thymocytes, RTEs, and MN T cells, we performed quantitative RT-PCR and flow cytometric analyses to compare methyltransferase-specific RNA and protein expression levels in these three cell populations directly ex vivo. Compared with MN T cells, both mature CD4+ SP thymocytes and RTEs express significantly more Dnmt1 and Dnmt3a mRNA, whereas expression of Dnmt3b message is significantly higher in CD4+ SP thymocytes compared with both RTEs and MN T cells (Fig. 6A, left and middle panels). Interestingly, our data (Fig. 6A, right panel) also show that, compared with CD4+ MN T cells, naive RTEs express more Tet1 mRNA (25, 28). DNMT protein levels were measured because previous reports have shown discordance in methyltransferase mRNA and protein expression, perhaps a result of posttranslational modification (26). By flow cytometry, protein expression levels of DNMT1 were slightly higher in mature SP thymocytes than in either RTEs or MN T cells, whereas DNMT3a protein expression levels were highest in mature SP thymocytes, intermediate in RTEs, and lowest in MN T cells (Fig. 6B). Compared with mature thymocytes, DNMT1 and 3a protein but not RNA levels were lower in RTEs. No differences in DNMT3b protein expression levels were detected in the three populations, perhaps because of the low and variable expression levels and the consequent need for a three-stage staining protocol to amplify the signal. Differential DNMT and demethylase expression by CD4+ RTEs and MN T cells. (A) Quantitative RT-PCR for Dnmt1, Dnmt3a, Dnmt3b, and Tet1 was performed on mRNA from mature (GFP+TCRβ+CD69lo) CD4+ SP thymocytes (Thy), CD4+ RTEs, and MN T cells. Data are from triplicate reactions normalized to an internal HPRT control and are compiled from two to three biological samples. Bars, mean ± SEM. *p < 0.05; **p < 0.005 (unpaired Student t test). (B) Flow cytometric analysis of DNMT1, DNMT3a, and DNMT3b protein expression in mature (GFP+TCRβ+CD62Lhi) CD4+ SP Thy, CD4+ RTEs, and MN T cells. Histograms show data representative of four or more experiments. Shaded histogram represents secondary stain without primary Ab. Graphs depict mean ± SEM of mean fluorescence intensity (MFI) of stained/background samples, compiled from all experiments. Use of the DNMT Abs for flow cytometry was validated by quantifying the activation-induced DNMT expression by CD4+ T cells by Western blot analysis and confirming it recapitulated the flow cytometric data. *p < 0.05, **p < 0.005 (paired Student t test). The data presented in this paper provide strong evidence for the role of epigenetic regulation in enforcing the pattern of IL-2 and IL-4 production by Th0-activated RTEs that distinguishes them from similarly activated mature T cells. Compared with both their thymocyte precursors and mature but still naive CD4+ T cells, RTEs are hypermethylated at the Il-2 locus, particularly at sites −216 and −261, and it is these sites that are most extensively demethylated in RTEs activated under Th0 conditions. Although methylation levels are similar at the four CpG sites between RTEs and MN T cells after Th0 stimulation, division-dependent pharmacological demethylation drives RTEs to produce IL-2 at the same level as similarly treated mature T cells, despite the proliferative defect that characterizes Th0-stimulated RTEs. These data suggest that DNA methylation—potentially at other key CpG sites in cytokine loci—is at least partially responsible for reduced IL-2 production by Th0-activated RTEs. Our data differ somewhat from those of two previous studies in which activation of peripheral T cells resulted in IL-2 secretion and Il2 promoter demethylation (12, 13). In apparent contrast, activation of mature T cells in our experiments was not associated with Il2 promoter demethylation. Perhaps the inadvertent inclusion in these previous study populations of RTEs (whose Il2 promoter regions are demethylated during T cell activation) may contribute to these discrepancies. This possibility is strengthened by the fact that 4- to 5-wk-old mice were used in at least one analysis (13), an age at which ∼50% of peripheral T cells are RTEs (29). The >150-fold difference in the activating dose of anti-CD3 (60 ng/ml for our experiments and 10 μg/ml for the experiments reported by Bruniquel et al. (12)) is another likely contributor to the differences between our data and those of these prior studies (13). Our work demonstrates that hypermethylation in the Il4 promoter region likely drives the diminished cytokine production by RTEs because inhibiting methylation allows Th0-activated RTEs to reach MN T cell IL-4 production levels. However, our data cannot exclude the possibility that demethylation at sites outside of cytokine loci contribute to enhanced cytokine secretion by treated RTEs. 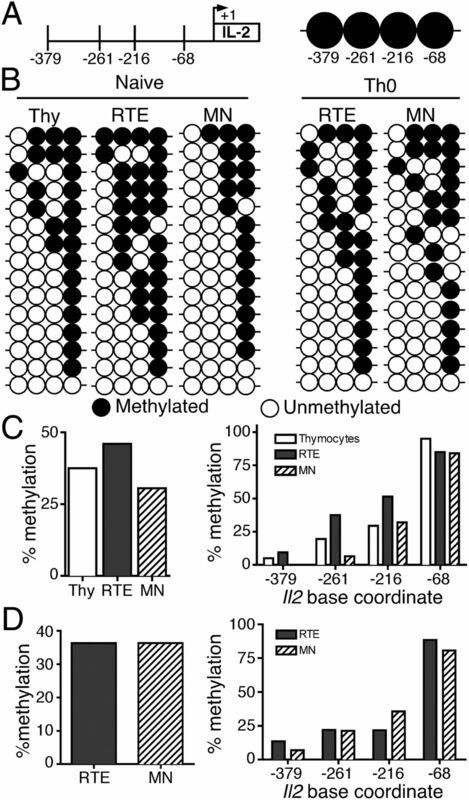 Sites −331 and −277 of the Il4 promoter in both naive and Th0-activated RTEs exhibit the greatest difference in methylation from their mature T cell counterparts, suggesting that the methylation status of these sites is important for controlling the differential IL-4 production between RTEs and MN T cells under Th0 conditions. Although dramatic demethylation of the Il4 promoter accompanies Th2 differentiation of RTEs, RTEs and MN T cells eventually reach similar levels of total methylation. Despite undergoing the most striking demethylation during Th2 differentiation, CpG site −331 remains more highly methylated in CD4+ RTEs compared with MN T cells under all conditions. These data suggest that the degree of methylation at the Il4 promoter is not the only factor determining the differential IL-4 production by RTEs and MN T cells. Indeed, it is likely that a complex interplay between an inherent bias against Th1 differentiation enforced by low T-bet and IL-12R surface expression levels may contribute to the tendency of Th2-activated RTEs to make more IL-4 than MN T cells (1, 2, 5). Murine neonatal T cells, unlike adult RTEs, are Th2-biased directly ex vivo, owing in part to distinct DNA methylation patterns at a Th2 cytokine regulatory region (30). Further analyses of transcription factor binding sites within this area may provide insight into the ramifications of these DNA methylation patterns. Our data run counter to previous work showing that thymocytes are hypomethylated at the Il4 promoter region compared with peripheral CD4 T cells (31), perhaps because of differences in the analyzed populations. By sorting on GFP, we excluded from our population any mature peripheral T cells that have reentered the thymus, including activated T cell populations that could be prone to IL-4 production (32). All of our methylation analyses depend on bisulfite conversion of DNA, long the method of choice for quantifying DNA methylation (33). The elucidation of TET1 function coupled with the inability of bisulfite sequencing to distinguish between 5-methylcytosine and its oxidation derivatives suggest it may be worthwhile in the future to use other means to verify the methylated CpG sites that distinguish RTEs from MN T cells (27). Although the biological significance of these oxidation derivatives in T cells is currently unclear, they could reveal additional mechanisms of genetic regulation (27, 28). Our data show that both mature SP thymocytes and RTEs express significantly higher mRNA levels of the DNA demethylase Tet1 than MN T cells. Although TET1 plays a role in epigenetic regulation during development in embryonic stem cells (28, 34), a role for TET1 in immune cells has only recently been appreciated. In three immune cell lines, activation-induced IL-2 production correlated with increased TET protein expression (35). Furthermore, TET1 is a negative regulator of IL-1β, and its expression in dendritic cells decreases in response to inflammation (36). Thus, there is growing evidence that the Tet proteins are involved in epigenetic regulation during immune cell activation. Our data are in line with those of the Immunological Genome Project (37) and suggest a further role for Tet1 during T cell development. Although RTEs are not a cell type included in their analysis, data from this consortium show that Tet1 is more highly expressed in mature SP thymocytes than in naive splenic CD4+ T cells. We cannot definitively say that TET1 is regulating methylation at the Il-2 and Il-4 loci, but our data do provide further evidence that RTEs and MN T cells are subject to distinct epigenetic regulation. In addition to providing some mechanistic basis for postthymic maturation, our analyses demonstrate that, relative to their SP thymocyte precursors, RTEs are hypermethylated at multiple sites within the Il2 and Il4 promoters, suggesting that thymic egress involves an active silencing process driven by methylation of particular CpG sites in cytokine loci. Our data also reveal that RTEs demonstrate a DNMT expression pattern that is distinct from that of both mature thymocytes and MN T cells. To our knowledge, these combined data are the first to clearly define RTEs as a population distinct from either their immediate thymocyte precursors or their mature peripheral T cell progeny. The higher DNMT3a RNA and protein expression in RTEs relative to their mature counterparts could implicate methyltransferases in the hypermethylation of cytokine loci in RTEs and may in particular contribute to their diminished ability to produce IFN-γ and IL-4 under Th0 conditions. DNMT3a is recruited to and implicated in the methylation of the ifnγ promoter of non-Th1 helper subsets (19). Loss of DNMT3a in T cells results in methylation patterns that allow for spontaneous dual cytokine production of IL-4 and IFN-γ (26). The downregulation of DNMT3a expression by costimulatory signals (26) combined with the lower CD28 expression on RTEs relative to MN T cells (3) provide one potential mechanism for the hypermethylation of cytokine loci in RTEs. The higher levels of both DNA methyltransferase and demethylase expression by RTEs relative to MN T cells are somewhat counterintuitive. However, these surprising data suggest that, compared with both their thymocyte precursors and the MN T cells they later become, RTEs may be uniquely poised for dynamic regulation of gene expression through rapid DNA methylation and demethylation (25). The only molecule previously implicated in influencing the process of RTE postthymic maturation is the transcriptional repressor NKAP (38). Therefore, it is appealing to suggest that NKAP represses transcription of DNMTs, thereby setting in motion the demethylation that accompanies the progression of RTEs into the mature T cell compartment. However, there is no known connection between NKAP and DNMTs, and NKAP lacks any previously characterized DNA-binding domains (39), making it likely that its transcriptional repression is exerted by indirect means. In sum, our data point to active DNA methylation modification during postthymic maturation, suggesting that RTEs, rather than merely occupying the midpoint between SP thymocytes and mature peripheral T cells, instead are programmed for specific functionality during their maturation period in the periphery. An important aspect of this maturation process may be endowing RTEs with the capacity to dynamically regulate the methylation status of key cytokine loci. Thus, epigenetic control of cytokine expression not only regulates the response of mature T cells to environmental cues sampled during Ag encounter but also defines the transition period during which newly generated T cells acquire the functional and phenotypic properties of fully mature T cells. We thank Drs. A. Weinmann and M. Sekimata for protocols and discussion. This work was supported by National Institutes of Health Grant R01 AI064318 (to P.J.F. ), a National Cancer Institute Basic and Cancer Immunology grant (to D.W.H. ), and Predoctoral Training Grant T32 GM07270 from the National Institute of General Medical Sciences (to A.M.B.).
. 2011. Post-thymic maturation: young T cells assert their individuality. Nat. Rev. Immunol. 11: 544–549. 2013. The biology of recent thymic emigrants. Annu. Rev. Immunol. 31: 31–50.
. 2004. Continued maturation of thymic emigrants in the periphery. Nat. Immunol. 5: 418–425.
. 2009. Human CD4+ T cell recent thymic emigrants are identified by protein tyrosine kinase 7 and have reduced immune function. J. Exp. Med. 206: 275–285.
. 2011. Recent thymic emigrants are biased against the T-helper type 1 and toward the T-helper type 2 effector lineage. Blood 117: 1239–1249.
. 2003. An epigenetic view of helper T cell differentiation. Nat. Immunol. 4: 616–623.
. 2005. DNA methylation and the expanding epigenetics of T cell lineage commitment. Semin. Immunol. 17: 105–119.
. 2006. T helper cell differentiation: regulation by cis elements and epigenetics. Immunity 24: 369–379.
. 2001. The role of DNA methylation in mammalian epigenetics. Science 293: 1068–1070.
. 2003. Selective, stable demethylation of the interleukin-2 gene enhances transcription by an active process. Nat. Immunol. 4: 235–240.
. 2005. Signals from CD28 induce stable epigenetic modification of the IL-2 promoter. J. Immunol. 174: 4639–4646.
. 2006. A specific CpG site demethylation in the human interleukin 2 gene promoter is an epigenetic memory. EMBO J. 25: 1081–1092.
. 2006. Regulation of Th2 differentiation and Il4 locus accessibility. Annu. Rev. Immunol. 24: 607–656.
. 1999. Continued RAG expression in late stages of B cell development and no apparent re-induction after immunization. Nature 400: 682–687.
. 2008. Cutting edge: contact with secondary lymphoid organs drives postthymic T cell maturation. J. Immunol. 181: 5213–5217.
. 1980. Cellular differentiation, cytidine analogs and DNA methylation. Cell 20: 85–93.
. 2012. De novo DNA methylation is required to restrict T helper lineage plasticity. J. Biol. Chem. 287: 22900–22909.
. 2007. Comprehensive epigenetic profiling identifies multiple distal regulatory elements directing transcription of the gene encoding interferon-γ. Nat. Immunol. 8: 732–742.
. 2002. Th2 lineage commitment and efficient IL-4 production involves extended demethylation of the IL-4 gene. Immunity 16: 649–660.
. 1998. Helper T cell differentiation is controlled by the cell cycle. Immunity 9: 229–237.
. 1998. Cloning and characterization of a family of novel mammalian DNA (cytosine-5) methyltransferases. Nat. Genet. 19: 219–220.
. 2010. Active DNA demethylation: many roads lead to Rome. Nat. Rev. Mol. Cell Biol. 11: 607–620.
. 2009. Identification of DNA methyltransferase 3a as a T cell receptor-induced regulator of Th1 and Th2 differentiation. J. Immunol. 183: 2267–2276.
. 2011. Mechanisms and functions of Tet protein-mediated 5-methylcytosine oxidation. Genes Dev. 25: 2436–2452.
. 2009. Conversion of 5-methylcytosine to 5-hydroxymethylcytosine in mammalian DNA by MLL partner TET1. Science 324: 930–935.
. 2006. Thymic output in aged mice. Proc. Natl. Acad. Sci. USA 103: 8447–8452.
. 2003. Active recruitment of DNA methyltransferases regulates interleukin 4 in thymocytes and T cells. Nat. Immunol. 4: 1183–1190.
. 2007. Thymic emigration revisited. J. Exp. Med. 204: 2513–2520. 2011. Statistical approaches for the analysis of DNA methylation microarray data. Hum. Genet. 129: 585–595.
. 2010. Role of Tet proteins in 5mC to 5hmC conversion, ES-cell self-renewal and inner cell mass specification. Nature 466: 1129–1133.
. 2012. IL-2 and GM-CSF are regulated by DNA demethylation during activation of T cells, B cells and macrophages. Biochem. Biophys. Res. Commun. 419: 748–753.
. 2013. TET1 is a negative transcriptional regulator of IL-1β in the THP-1 cell line. Mol. Immunol. 54: 264–270.
. 2008. The Immunological Genome Project: networks of gene expression in immune cells. Nat. Immunol. 9: 1091–1094.
. 2011. NKAP is required for T cell maturation and acquisition of functional competency. J. Exp. Med. 208: 1291–1304.
. 2009. NKAP is a transcriptional repressor of notch signaling and is required for T cell development. Immunity 30: 696–707.